Napoleon (Napoleon Bonaparte or, after 1804, Napoleon I, Emperor of the French) was a world historic figure and dictator of France from 1799 to 1814. He was the greatest general of his age--perhaps any age, with a sure command of battlefield tactics and campaign strategies, As a civil leader he played a major role in the French Revolution, then ended it when he became dictator in 1799 and Emperor of France in 1804 He modernized the French military, fiscal, political legal and religious systems. He fought an unending series of wars against Britain with a complex, ever-changing coalition of European nations on both sides. Refusing to compromise after his immense defeat in Russia in 1812, he was overwhelmed by a coalition of enemies and abdicated in 1814. In 1815 he returned from exile, took control of France, built a new army, and in 100 days almost succeeded--but was defeated at Waterloo and exiled to a remote island. His image and memory are central to French national identity, but he is despised by the British and Russians and is a controversial figure in Germany and elsewhere in Europe. Born Napoleone Buonaparte at Ajaccio, Corsica, on Aug. 15, 1769, he was the second son of Carlo Buonaparte, a lawyer with some claim to noble rank, and Letizia Ramolino. Genoa had just sold Corsica to France. Carlo Buonaparte had fought for Corsican independence under Pasquale Paoli; he now switched and became a supporter of the French regime, which recognized his noble rank. When the King offered free education to impoverished noble families, Napoleon and several siblings were educated at royal expense. In 1779, after a few months' schooling at Autun to improve his French--he always had a thick Corsican accent--Napoleon entered the military academy at Brienne, which was run by a Catholic religious order. He remained there for five years. Taunted by his schoolmates as being provincial from the wildest and most violent part of France, and uncouth, a pauper even among the aristocratic poor, he professed an intense Corsican patriotism and hatred of the French "oppressors." In 1784 he was selected to attend the top-ranked Ecole Militaire in Paris to study the science and mathematics of artillery. Napoleon spent the year in luxury such as he had never known before, and graduated 42nd in a class of 130. Commissioned as second lieutenant of artillery, he was sent to Valence in southern France. There was revolution in the air; Napoleon was an intellectual and an ardent disciple of Voltaire, Rousseau and the philosophers; he saluted the people but hated mob violence. During his 10 years as a junior officer made 5 extended trips to Corsica, seeking a politico-military career, alongside Paoli or against him. He took prolonged leaves, adding up to three years in seven, sometimes failing to report back on time. In June 1793 Napoleon in Corsica was defeated by the Paolists; he and his family fled to France, joined the French revolutionary cause and forgot Corsica. Once the Revolution had begun, so many of the aristocratic officers turned against the Revolutionary government, or were exiled or executed, that a vacuum of senior leadership resulted. Promotions came very quickly now, and loyalty to the Revolution was as important as technical skill; Napoleon had both. His demerits were overlooked as he was twice reinstated, promoted, and allowed to collect his back pay. Paris knew him as an intellectual soldier deeply involved in politics. His first test of military genius came at Toulon in 1793, where the British had seized this key port. Napoleon, an acting Lieutenant-Colonel, used his artillery to force the British to abandon the city. He was immediately promoted by the Jacobin radicals under Robespierre to brigadier-general, joining the ranks of several brilliant young generals. He played a major role in defending Paris itself from counter-revolutionaries, and became the operational planner for the Army of Italy and planned two successful attacks in April 1794. He married Josephine (Rose de Beauharnais) in 1796, after falling violently in love with the older aristocratic widow. In Italy, Napoleon's rapid maneuvers proved brilliantly successful and had major long-term effects. He defeated Austria, France's most dangerous enemy. He established French hegemony in the Italian peninsula, put Vienna in an impossible strategic situation, and solidified his reputation as a military genius beloved by the men in the ranks; he became a major national hero, and thus a political force in his own right. 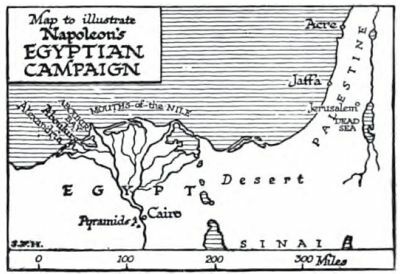 The governing Directory was happy to send Napoleon to far-off Egypt. In July 1798, Napoleon led the Armée d’Orient an expeditionary force of 36,000 men to conquer Egypt from the Ottoman Empire, the opening move in his plan to acquire a new colony for France, block England's access to India, and export the values of French republicanism to a modernized Middle East. Aware that Europe was ignorant of cultural and religious Islam, Napoleon brought along a hundred scholars and linguists. The scholars opened the field of Oriental studies; the third-ranking French general converted to Islam as Abdallah Menou. He easily defeated the 60,000-man army of the Marmelukes (horsemen) at the Battle of the Pyramids (July 21, 1798). Despite the failures in Egypt, Napoleon returned to a hero's welcome. In alliance with the director Emmanuel Sieyès and his brother, Lucien Bonaparte, president of the council of five hundred, he overthrew the Directory by a coup d'etat on November 9, 1799 ("the 18th Brumaire" according to the revolutionary calendar), and closed down the council of five hundred. Napoleon became "first consul" for ten years, with two consuls appointed by him who had consultative voices only. His power was confirmed by the new constitution ("Constitution of the year VIII"), originally devised by Sieyès to give Napoleon a minor role, but rewritten by Napoleon, and accepted by direct popular vote (3,000,000 in favor, 1,567 opposed). The constitution preserved the appearance of a republic but in reality established a military dictatorship. The days of Brumaire sounded the end of the short-lived republic: no more representative government, assemblies, a collegial executive, or liberty. The long string of wars was broken by the Treaty of Amiens (1802), which proved to be only a 14 month pause. 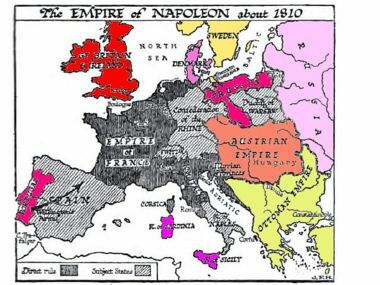 Napoleon used the interlude to make major territorial gains in Italy and Germany without firing a shot, an unexpected development that forced the British back to the battlefield. Napoleon's major adventure into the Caribbean--sending 30,000 troops in 1802 to retake Saint Domingue (Haiti) from ex-slaves under Toussaint L'Ouverture who had revolted. Napoleon wanted to preserve France's financial benefits from the colony's sugar and coffee crops; he then planned to establish a major base at New Orleans. He therefore reestablished slavery in Haiti and Guadeloupe, where it had been abolished after rebellions. Slaves and black freedmen fought the French for their freedom and independence. Revolutionary ideals played a central role in the fighting for it was the slaves and their comrades who were fighting for the revolutionary ideals of freedom and equality, while the French troops under General Charles Leclerc fought to restore the order of the ancien régime. The goal of reestablishing slavery - which explicitly contradicted the ideals of the French Revolution - demoralized the French troops. The demoralized French soldiers were unable to cope with the tropical diseases, and most died of yellow fever. Slavery was reimposed in Guadeloupe but not in Haiti, which became an independent black republic. Napoleon's vast colonial dreams for Egypt, India, the Caribbean, Louisiana, and even Australia were all doomed for lack of a fleet capable of matching Britain's Royal Navy. Realizing the fiasco Napoleon liquidated the Haiti project, brought home the survivors and sold off Louisiana to the U.S. The treaty of Tilsit in 1807 ended the War of the Third Coalition--in which Russia, Prussia, and Austria defeated in turn and Napoleon gained control of most of the continent. 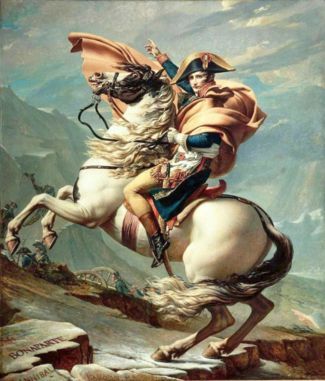 Napoleon's basic military strategy was to identify and defeat the enemy's main force. The goal was to break the enemy's will to resist so that favorable negotiations followed; the conquest of territory was won in negotiations. "I see only one thing," Napoleon explained in 1797, "namely the enemy's main body. I try to crush it, confident that secondary matters will then settle themselves." Less flamboyant was his close attention to selecting his generals, and his calculations of the logistical needs of a campaign. He also pioneered the use of the division as a combined arms formation, although he did not standardize their organization. Napoleon also made much more routine use of maps and accurate watches, for synchronizing operations, than had previous military commanders. His failure in Russia was due primarily to his bad logistical planning, a blunder historians have been unable to explain. In battle he paid close attention to the overall picture, but left the critical decisions to his marshals. He rarely issued detailed guidance on corps level tactical employment; instead he devised the overall battle plans, and directed the combined attacks of infantry, cavalry reserves, and massed batteries of guns. Since he was simultaneously head of the government, he integrated the military, political and diplomatic dimensions. He was an accurate judge of his opponents, except that is for Britain and Russia. He could never be at peace with Britain; with Russia he let his need for diplomatic prestige overcome his military judgment. The Battle of Austerlitz on 2 December 1805 is celebrated as Napoleon's greatest victory. The collapse of the Peace of Amiens led Britain to assemble the "Third Coalition" in April 1805, including Austria, Russia, and Sweden. After threatening to invade Britain, Napoleon sent 200,000 soldiers marching east. He used six army corps, each a self-contained, all-arms combat force. The corps was a Napoleonic invention, and each was strong enough to operate independently, allowing the army to advance along a broad front, which facilitated logistics (each army seized supplies in its region), and increased the speed of the advance. Napoleon commanded in person in Germany; relying on the support of most of the south German states, he advanced to meet the Austrians who had invaded Bavaria. On the upper Danube he concentrated his 200,000 men, reinforced by Bernadotte, and by allied from Bavaria, Württemberg, Baden, Hesse, Nassau. After the Austrians had been defeated in several engagements, their main army was surrounded at Ulm and surrendered 30,000 men on October 17, 1805 without a fight. At the same time the British navy won a total victory under Horatio Nelson sinking the combined French and Spanish fleet at Trafalgar on October 21, 1805, permanently destroying Napoleon's sea power. On December 2, 1805, at the Battle of Austerlitz, called "the battle of the three emperors," Napoleon split the enemy center, encircled the enemy left, and won a smashing victory over the united forces of Austria and Russia. Napoleon lost 9000 men, the enemy 26,000. Austria made peace; the Russians retreated. The increased importance of artillery after 1807 stemmed from Napoleon's creation of a highly mobile artillery force, the growth in artillery numbers, and changes in artillery practices. As a result of these factors, Napoleon, rather than relying on infantry to wear away the enemy's defenses, now could use massed artillery as a spearhead to pound a break in the enemy's line that was then exploited by supporting infantry and cavalry. In 1807 Napoleon created a powerful outpost of his empire in Eastern Europe. Poland had recently been divided up by its neighbors, but Napoleon created the Grand Duchy of Warsaw, which depended on France from the very beginning. The duchy consisted of lands seized in Russia, Austria, and Prussia; its Grand Duke was Napoleon's ally the king of Saxony, but Napoleon appointed the intendants who ran the country. The 2.5 million Poles thrilled to the opportunity and by 1814 sent about 200,000 men to Napoleon's armies, including about 90,000 who marched with him to Moscow. The Russians strongly opposed any move toward an independent Poland and to punish them Napoleon invaded in 1812. Napoleon's impact on Poland was dramatic, including the Napoleonic legal code, the abolition of serfdom, and the introduction of modern middle class bureaucracies. The fiasco in Russia in 1812 wounded Napoleon's political prestige, emptied his treasury and encouraged his enemies to greater exertions and nations on the fence to turn against France. Diplomatic historians blame Napoleon's inflexibility and unwillingness to compromise when he was winning (before Russia), and, especially, when the odds had turned against him in 1813-14; in January 1813, Napoleon rejected Prussian terms; that summer he mishandled Austria; in early 1814 he fumbled the final offer of peace made at Chatillon in March 1814. That political failure doomed him. The Allies then signed a 20 year alliance (the Treaty of Chaumont), stuck together, and switched Bavaria away from Napoleon. Military setbacks in Spain further weakened his cause and exposed France to an attack through Spain. While Napoleon could recruit replacement troops, the loss of experienced cavalry in 1812 meant that he could not exploit his victories at Luetzen and Bautzen in 1813. His army of raw and ill-equipped recruits was outnumbered and France was war-weary; on the other hand, the Allies were also exhausted, and had longer lines of communications and supply. Man for man, except for Wellington's British, the French probably remained better soldiers than their opponents to the very end. 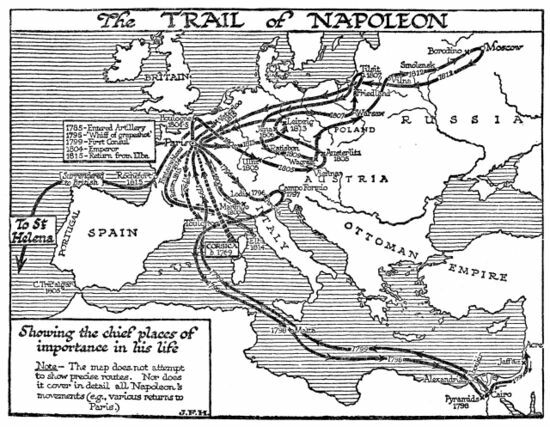 Napoleon mishandled the campaigns in north Germany in 1813. Instead of concentrating his forces for a decisive battle with the enemy's main force, Napoleon repeatedly detached large numbers of troops under ineffective commanders to capture the Prussian capital of Berlin. The heavy losses and strategic reverses sustained by the French in these questionable undertakings left Napoleon's Grande Armée vulnerable to the massive Allied coalition that met him at Leipzig. He won at Dresden but Napoleon's mistakes were uncharacteristic of him at a younger age; he now underestimated the strength of his enemies and overestimated his own, and he was driven less by calculation than by thirst for revenge against Prussia, a onetime ally who switched against him. Napoleon's decisive defeat came at the Battle of Leipzig, called "the battle of nations" in October 1813. Napoleon's 180,000 French and Saxon and Württemberg troops were overwhelmed by 320,000 Allies, comprising Austrian, Russian, and Prussian armies. It was the biggest battle to date in European history, with 100,000 to 120,000 killed, wounded or captured on both sides. Napoleon managed to escape to France with a portion of his army, but the disaster was almost as great as that in Russia in 1812 and even more irreparable; all the German states now joined the Allies, the Dutch expelled the French, and Denmark was forced to accept terms. In early January, 1814, 200,000 Allied troops invaded France. Napoleon scored some small victories but the Allies took Paris on March 31, his government declared him deposed, and his marshals deserted him. Napoleon abdicated and was sent into exile at Elba (an island north of Rome), as the old monarchy was brought back to France. The French army, now controlled by Louis XVIII numbered 460,000 men, but most were still loyal to Napoleon. In March 1815, Napoleon secretly landed in France and rallied his supporters. They flocked to his cause as the French royal officials lost control; Napoleon entered Paris in triumph and raised new armies. The Allies, meeting at a peace conference in Vienna, sent a million soldiers to stop him. The largest contingents was a multinational force under the command of the Briton, the Duke of Wellington. Napoleon defeated the German army under Blücher at Ligny but had to turn and stop Wellington before he merged forces with Blücher. 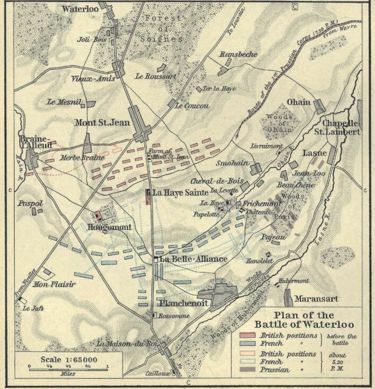 At a very hard and closely fought battle of Waterloo on June 18, 1815, Blücher arrived at the last moment and Napoleon was finally and totally defeated. He surrendered to the British who sent him in exile to the remote island of St. Helena in the south Atlantic, where he died a prisoner in 1821. His relatives lost their royal positions; his imperial army, and particularly the legendary Imperial Guard, were disbanded, and Europe entered an era of peace. The Revolution had resisted efforts towards federalism, insisting on the Republic one and indivisible, and Napoleon continued the policy of centralization, with all the provinces governed by powerful prefects whom he selected. It has been claimed that they were more powerful than royal intendants of the ancien régime, though this is at variance with the evidence adduced by de Tocqueville. The impact in unifying the nation, minimizing regional differences as far as possible, and shifting major decisions to Paris was a long-term one. Of permanent importance was the Code Napoléon (1806), created by eminent jurists under Napoleon's supervision. Praised for its Gallic clarity, it spread rapidly throughout Europe and the world in general. The Code recognized the principles of civil liberty, equality before the law, and the secular character of the state. It discarded the old right of primogeniture (where only the eldest son inherited) and ruled that inheritances should be divided equally among all the children. The court system was standardized, with all judges appointed by Paris. Religion had been a major issue during the Revolution, and Napoleon resolved most of the outstanding problems. Thereby he moved the clergy and large numbers of devout Catholics from hostility to the government to support for him. The Catholic system was reestablished by the Concordat of 1801 (signed with Pope Pius VII), so that church life returned to normal; the church lands were not restored, but the Jesuits were allowed back in and the bitter fights between the government and Church ended. Protestant and atheists were tolerated. The French taxation system had collapsed in the 1780s. In the 1790s the government seized and sold church lands and lands of exiles aristocrats. Napoleon instituted a modern, efficient tax system that guaranteed a steady flow of revenues and made long-term financing possible. He kept the system of conscription that had been created in the 1790s, so that every young man served in the army, which could be rapidly expanded even as it was based on a core of careerists and talented officers. Before the Revolution the aristocracy formed the officer corps. Now promotion was by merit and achievement--every private carried a marshal's baton, it was said. Broers (1996) distinguishes the "inner" and "outer" empire. 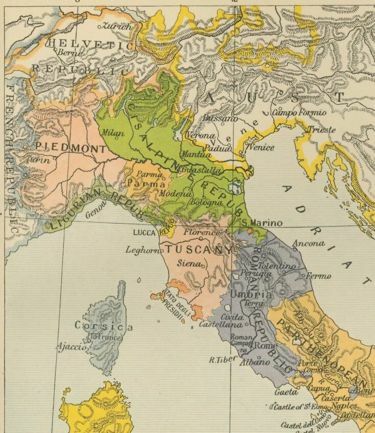 The "Inner" Empire included France itself and Belgium, the Netherlands, the Rhinelands, most of western Germany, Switzerland, and northern Italy. These areas were integrated into an efficiently administered and largely obedient bloc. Napoleon sought to rally hostile political factions of both right and left to his rule (ralliement), as well as to fuse them into a loyal administrative class. In return for their services and obedience, Napoleon offered this new elite social order a coherent legal code and protection of their property. The "outer" empire, comprised the German Hanseatic territories, former Papal States, Illyrian provinces, and the kingdom of Spain (ruled by his brother Joseph Bonaparte). It displayed little enthusiasm for French occupation and resented the imposition of high taxes, enforcement of the Continental blockade against trade with England and America, application of the Concordat with the Pope to protect the Catholic Church, and especially, conscription demands to supply troops for the Grande Armee, such as the 300,000 lost in Russia in 1812. In the Outer Empire banditry flourished, elites refused to cooperate with the occupier, and the forces of counterrevolution remained active. Napoleonic rule rested on an insecure alliance of local collaborators and French administrators, both of whom were unpopular with their subjects. Grab (1996) shows heart of the French occupation of Europe was a combination of reform and exploitation designed to extract men and money more efficiently from the subject states. Napoleon lifted all restriction on Jews in France and its empire. In Germany and Italy, especially, this marked a dramatic liberation from the ghetto. After overcoming the forces of the coalition in 1807, Napoleon decided to create a powerful outpost of his empire in Eastern Europe. He established the Grand Duchy of Warsaw, which depended on France from the very beginning. The duchy consisted of lands seized in Russia, Austria, and Prussia. He gave some support to the Polish struggle with Russia, which wanted to keep Poland within its sphere of power. The addition of west Galicia to the duchy of Warsaw by the peace of Vienna, had caused Czar Alexander anxiety lest the restoration of Poland should be contemplated, and this was a factor that led to Napoleon's invasion of Russia in 1812. In terms of impact on events, it was more than Napoleon's personality that took effect. He chose outstanding generals, and stood by them. He reorganized France itself to supply the men and money needed for great wars. Above all he inspired his men--Wellington said his presence on the battlefield was worth 40,000 soldiers, for he inspired confidence from privates to field marshals. The force of his personalities neutralized material difficulties as his soldiers fought with the confidence that with Napoleon in charge they would surely win. Napoleon's extensive and masterful use of propaganda contributed to his rise to power, legitimated his regime, and established his image for posterity. Strict censorship, controlling every aspect of the press, books, theater, and art, was only part of his propaganda scheme, aimed at portraying him as bringing desperately wanted peace and stability to France. The propagandistic rhetoric changed in relation to events and the atmosphere of Napoleon's reign, focusing first on his role as a general in the army and identification as a soldier, and moving to his role as emperor and a civil leader. Specifically targeting his civilian audience, Napoleon fostered an important, though uneasy, relationship with the contemporary art community, taking an active role in commissioning and controlling all forms of art production to suit his propaganda goals. The memory of Napoleon in Poland is highly favorable, for his support for independence and opposition to Russia, his legal code, the abolition of serfdom, and the introduction of modern middle class buraucracies. Hazareesingh (2004) explores how Napoleon's image and memory is best understood when considered within its socio-political context. It played a key role in collective political defiance of the Bourbon restoration monarchy in 1815-30. People from all walks of life and all areas of France, particularly Napoleonic veterans, drew on the Napoleonic legacy and its connections with the ideals of the 1789 revolution. Widespread rumors of Napoleon's return from St. Helena and Napoleon as an inspiration for patriotism, individual and collective liberties, and political mobilization manifested themselves in seditious materials, notably displaying the tricolor and rosettes, and subversive activities celebrating anniversaries of Napoleon's life and reign and disrupting royal celebrations, and demonstrated the prevailing and successful goal of the varied supporters of Napoleon to constantly destabilize the Bourbon regime. Datta (2005) shows that following the collapse of militaristic Boulangism in the late 1880s, the Napoleonic legend was divorced from party politics and revived in popular culture. Concentrating on two plays and two novels from the period - Victorien Sardou's Madame Sans-Gêne (1893), Maurice Barrès's Les Déracinés (1897), Edmond Rostand's L'Aiglon (1900), and Gyp's Napoléonette (1913) Datta examines how writers and critics of the Belle Epoque exploited the Napoleonic legend for diverse political and cultural ends. Reduced to a minor character, the new fictional Napoleon was not a world historical figure but an intimate one fashioned by each individual's needs and consumed as popular entertainment. In their attempts to represent the emperor as a figure of national unity, proponents and detractors of the Third Republic used the legend as a vehicle for exploring anxieties about gender and fears about the processes of democratization that accompanied this new era of mass politics and culture. ↑ The British defeated the French army in Egypt in 1801 and allowed it to return to France. ↑ Englund p 259. Slavery remained in Guadeloupe until 1848. ↑ Bruce McConachy, "The Roots of Artillery Doctrine: Napoleonic Artillery Tactics Reconsidered." Journal of Military History 2001 65(3): 617-640. Issn: 0899-3718 in Jstor. McConachy rejects the alternative theory that growing reliance on artillery by the French army beginning in 1807 was an outgrowth of the declining quality of the French infantry and, later, France's inferiority in cavalry numbers. ↑ Riley (2000) p. 27-8. 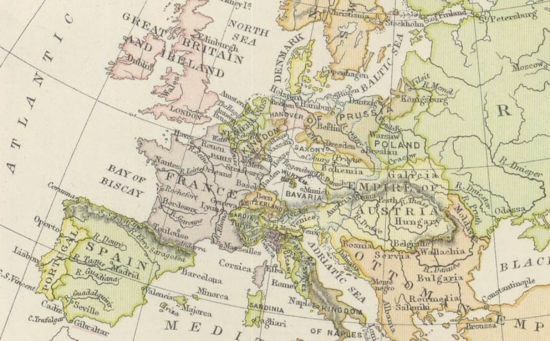 The Grand Duchy was dissolved in 1815 and Poland would not be a state until 1918. ↑ de Tocqueville, A. (ed Headlam, G W) L'Ancien Régime. Oxford. At the Clarendon Press. 1904. ↑ Frederic Cople Jaher, The Jews and the Nation: Revolution, Emancipation, State Formation, and the Liberal Paradigm in America and France (2002) pp 103-37. ↑ See Chandler, "General Introduction" to The Campaigns of Napoleon (1975). This page was last modified 21:57, 24 May 2014.